Egg-laying chickens and chicken coops are no longer a sight seen only in rural areas. 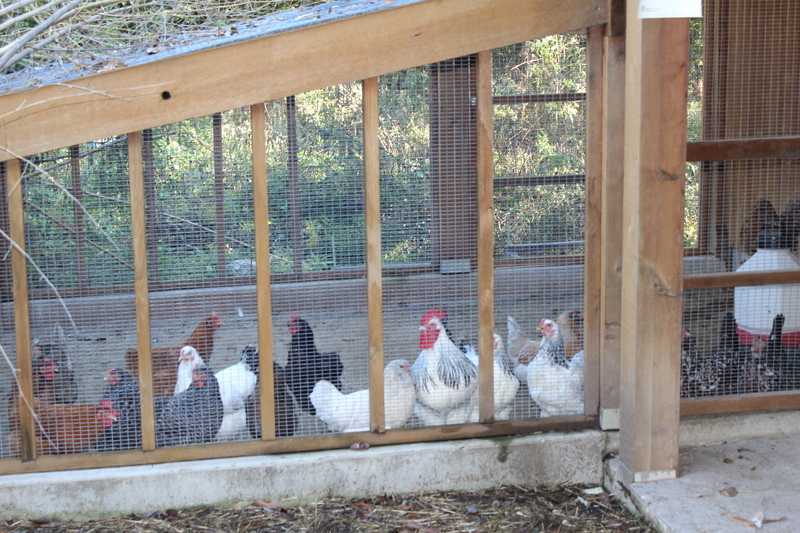 Coops are popping up in suburban backyards like Webster and Kirkwood. Sustainability and a desire to reconnect with natural food sources seems to be driving the popularity of keeping the feathery egg-laying pets. Kathy Hawkins, Kirkwood code enforcement administrator, said she thinks chicken keeping is not only popular, but possibly growing in popularity. She bases this idea on the number of inquiries and calls she receives about the topic. Also, the number of people she hears saying they own chickens. The city of Kirkwood does not require permits to own chickens. There is no restriction on the number of chickens a person can keep. And Kirkwood allows roosters. General city code also apply to chicken keeping, according to Hawkins. Some of the codes include, noise nuisances, cleanliness, structure dimensions and location, and keeping the chickens within property boundaries. 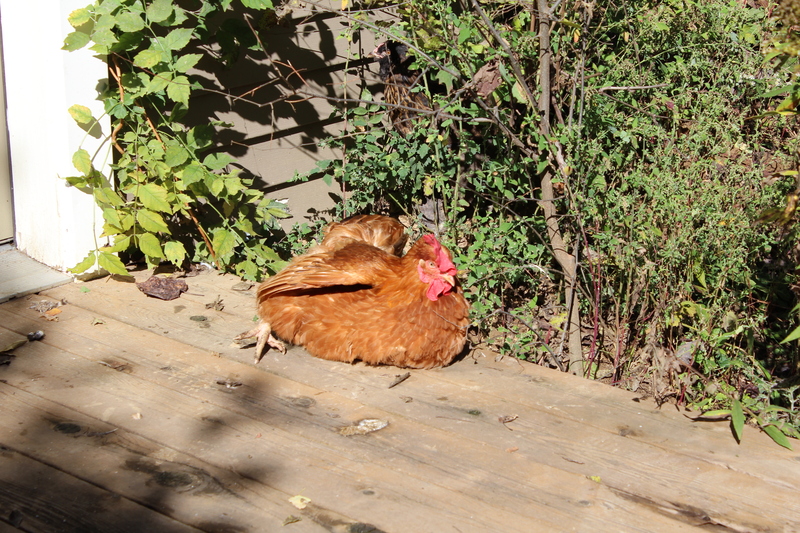 Without permits, there is no record of how many property owners keep chickens in Kirkwood. Hawkins said she receives very few complaints from residents about chickens. When she does get a complaint it is usually about a noisy rooster or chickens that are roaming where they should not be. Any complaints received are forwarded to the local police department. Webster Groves does require permits and limits ownership to a total of eight chickens. Roosters are not allowed. Permits must be renewed every three years and cost $30. An inspection is required to obtain a new permit or to renew an existing permit. Webster Groves planning and development department took over issuing permits from the city clerk in late spring of 2013. New regulations were adopted affecting permits issued after that transition, according to Senior Planner Matt Ament. Ament says his department took over the chicken permits only last year, but over the spring and summer he saw an increase in calls inquiring about keeping chickens in Webster. The inquiries are not as frequent in the fall and winter. Currently, there are 45 permits issued for residents to legally keep chickens in the city of Webster Groves with 12 in that total issued since last year. 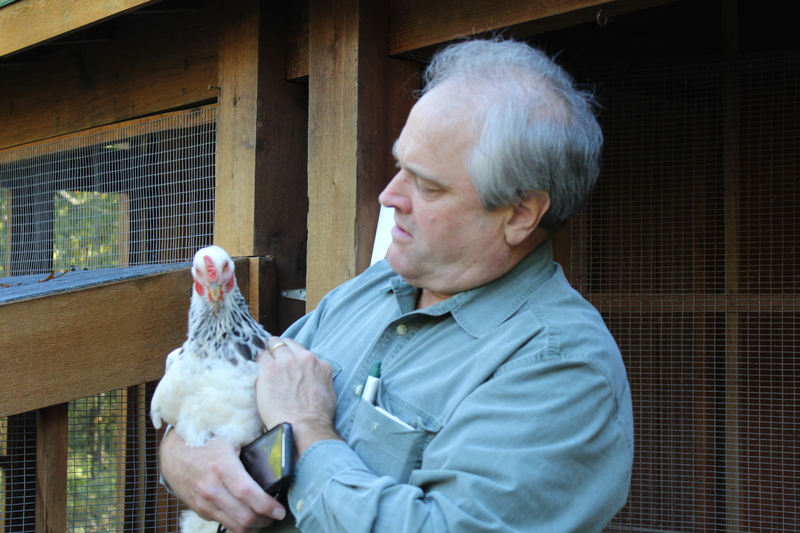 Bill Ruppert, Kirkwood, started keeping chickens in 2005. 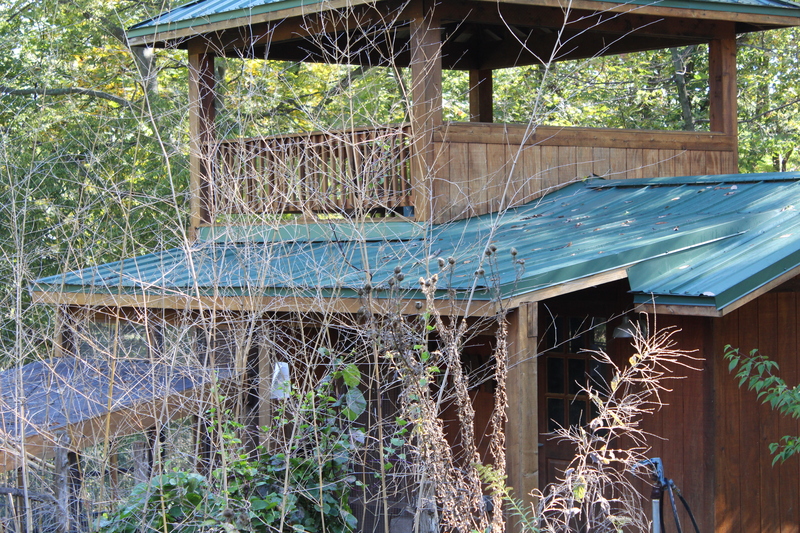 He said he has fond childhood memories of his aunt’s home in the country, which included a chicken coop. As a kid from the city he could not wait to go visit and look for eggs. Those memories stuck with him into adulthood and he decided to build his own coop. He says that fresh eggs taste better as well. Ruppert owns and manages the St. Louis office of National Nursery Products. He participates in many natural resource, horticulture and gardening organizations. He also gives lectures about local chicken keeping. Bill Ruppert holding his chicken, Barbie. Photo by Holly Shanks. chickens are usually a good fit for people who like gardening. 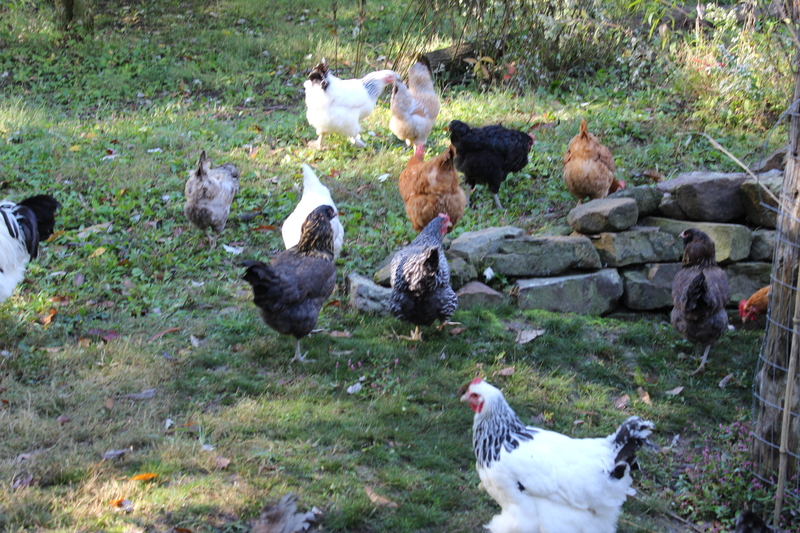 Chickens offer a good source of fertilizer and insect control. However, choosing to have chickens requires a commitment. A clean structure or coop is needed to keep the chickens and their food dry, along with the basic maintenance that goes along with those things. Seth and Maria Jansen decided to take a chance and start a business called The Easy Chicken based in Florissant. They saw an opportunity to offer something that could connect urban dwellers to a sustainable food source. They have four young boys ranging in ages from two to seven and the endeavor has brought the entire family closer together, according to Maria Jansen. 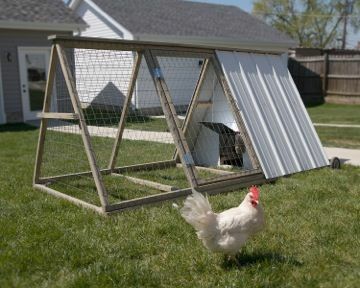 The Easy Chicken rents custom-made portable chicken coops complete with two egg laying hens, which in peak season can lay four to six eggs per week. Different packages and price points give clients option choices. The first delivery of live chickens began in April and they sold out of chickens this year and already have clients lined up for the coming year. The Easy Chicken handmade coop and hens. Photo courtesy The Easy Chicken. The Jansens offer start-up classes and mentorship as part of their business and even a chicken support hot-line. Calls on the hot-line have consisted of questions about things like predators and the habit of dust bathing. Chickens will clean themselves by dusting in dirt. They dig a hole, roll around and can look like they are going into contortions, according to Maria. This is a natural process and the chickens normally are fine, but the sight can worry the new and inexperienced owner. Ruppert said predators that can pose a threat to chickens are animals, such as foxes, raccoons, coyotes, minks, and birds of prey like owls and hawks. Snakes will eat eggs, but do not normally pose a danger. He stressed the importance of a well-protected coop having experienced predator issues in the past. An owl took his very first chicken and the coop had to be retrofitted with smaller mesh wire after a terrible mink massacre that killed 24 of his 30 chickens. Minks are a member of the weasel family. They are semi-aquatic carnivores with long slender shaped bodies. They can wiggle through small tight openings. 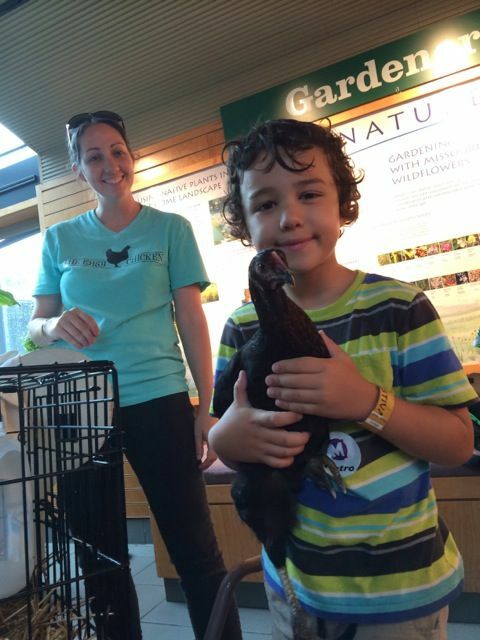 Joseph and Maria Jansen presenting information about backyard chickens during the Green Homes Festival at the Missouri Botanical Gardens. Photo Courtesy The Easy Chicken. Maria Jansen said her family likes taking their chickens to local farmers markets not only for business purposes, but to show and teach people about the benefits of chickens. This entry was posted in Environment, Home, Outdoor/Nature. Bookmark the permalink.